When I was elected as my country’s president, one of my principal goals was to see Chile accepted as a full member of the Organisation for Economic Co-operation and Development. International integration has been a keystone of the foreign policy of Chile’s government coalition - the Concertación - since it was first elected in 1990 with the restoration of democracy. Its commitment to international integration was one reason for seeking admission to the OECD. Video of Madame Bachelet's address to council. Our interest in forming part of the OECD also has to do with the countries that make up the Organisation - like-minded countries, countries that are committed to democracy, to promoting economic growth and trade, to creating jobs and raising living standards, to social equality and sustainable development, to maintaining financial stability, and to transparency. The opportunities the OECD offers for exchanging views with these countries, for learning from them, and for establishing ties of co-operation will - we are certain - help to consolidate Chile’s position as a relevant player in global policy-making. We also believe that full OECD membership will have unparalleled benefits not only for our country’s position in the world but also at home for our citizens. The OECD is sometimes referred to as a club of rich countries; it should be referred to, instead, as a club of countries that promote and foster best practices. As part of Chile’s process of accession to the OECD, we have had to take a long and hard look at our laws, public policies and procedures - even at our statistics - and, in some cases, improve them to bring them up to the highest international standards. 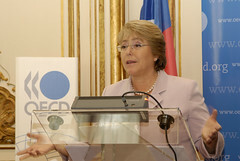 Even before the OECD’s invitation to seek accession in 2007, Chile was adopting OECD recommendations and guidelines as part of its process of modernisation of the state. For example, OECD guidelines were the basis for the bills on corporate governance of state-owned and private companies that are now well on their way through Congress. The same is true of the plans we drew up on freedom of competition and the protection of consumer rights. More recently - and, again, with the aim of achieving the highest international standards - we have presented to Congress a bill based on Article 26 of the OECD’s Model Tax Convention to facilitate the exchange of banking information for tax purposes. We know that approval of this bill is fundamental for Chile’s entry into the OECD. But we also see it as part of a global trend towards greater transparency and accountability in financial transactions, from which Chile cannot be absent. The OECD’s surveys and peer reviews have helped us devise and implement new policies, laws and practices in many areas of national life. Innovation is one example. An OECD report published a few years ago helped Chile design and implement programmes to boost our competitiveness and foster entrepreneurship. Similarly, the OECD’s evaluation of Chile’s environmental performance in 2005 focused our attention on the need to develop norms and strengthen enforcement. The result was a bill to restructure our institutional framework by creating a Ministry for the Environment, a Superintendency, and an Environmental Evaluation Service. In 2008, we also launched a National Strategy for Integrated River Basin Management and a National Policy on Chemical Safety. These initiatives were vital to improve our standards on the management of water resources and chemical substances, and will bring us closer into line with OECD Member countries in these fields. In December last year, my government then went on to present a National Action Plan for Climate Change. The latest scientific evidence underscores the pressing need to address the phenomenon of global warming and its likely effects, from which Chile will certainly not be immune. In that context, it is our belief - and the aim of this Plan - that early response is the best preparation not only for fulfilling our commitments under the UN Framework Convention on Climate Change and adapting to climate change, but also for positioning Chile to play a constructive role in international debate and solutions. We are convinced that Chile can contribute to this Organisation in many ways, thanks to our progress and achievements in important areas of economic and social life. These include our fiscal policy and our system of financial regulation and supervision. In previous crises, emerging countries found themselves shackled by fiscal deficits, high public borrowing, and currency misalignments. Chile tackled these problems. It put its accounts in order and, through fiscal prudence, reduced its borrowing. The result today is an economy that is far less vulnerable. But we went further than that. We institutionalised a fiscal policy rule under which Chile saves during the good times and, by law, we created sovereign wealth funds, precisely to guard against external shocks such as we are seeing now. Thanks to these savings, we can use fiscal stimulus to help the economy’s recovery and protect those Chileans most vulnerable to the effects of the crisis. In January, my government launched a fiscal stimulus plan worth 4 billion dollars. For some countries, that wouldn’t be such a large amount but, for Chile, it represents 2.8% of GDP. In other words, more than the IMF’s recommended 2%. With what we put aside during the boom times, we are now building roads, schools, social housing, childcare centres, hospitals and sports stadiums. By creating productive jobs, we are also multiplying the impact of that investment. An investment that will, moreover, be a plus for our country’s future development and the wellbeing of our citizens. And, most importantly, instead of reducing social spending in the face of the crisis, we are actually raising it. And we are doing so without increasing public debt. A few months ago, we modified our unemployment insurance system so that Chilean workers are better protected if they lose their jobs. This year too, thanks to a pension reform approved last year, my government will increase the basic solidarity pension, received by the most vulnerable Chileans, by 25%. In the early 1980s, Chile learnt a dramatic lesson in the importance of financial regulation and supervision. After that banking crisis, Chile placed limits on the risk exposure of its financial institutions, regulated conflicts of interest and stepped up disclosure requirements. Those changes have stood us in good stead. Today, our financial system has not suffered the problems that some OECD Member countries have had to face. Our banking system is in good health and has withstood the international crisis relatively well. The OECD’s invitation to Chile, Estonia, Slovenia, Israel and Russia to enter into accession talks reflects your Organisation’s interest in aligning its membership with new global realities and, in this way, contributing to the development of non-member countries as well as Member countries. The OECD that we hope to join is not the OECD we knew in the early 1990s. You have been explicit about the need to forge closer ties with emerging economies of the weight and increasing influence of, for example, Brazil, China, India, Indonesia and South Africa, through your enhanced engagement strategy. We see this strategy as an important part of the Organisation’s efforts to make an ongoing contribution to global economic and social development. We believe it will help to form an ever stronger bridge between the OECD and the needs and priorities of developing countries in Asia, Africa and Latin America, and we wholeheartedly applaud these efforts. But, just as the OECD is not the OECD we knew in the early 1990s, so too Chile is not the country you knew then, when democracy had just been re-established. Today, Chile is a consolidated democracy and a middle-income economy. Building on these achievements, our goal now as a country is to attain development within the space of a generation. A number of Asia-Pacific and European economies have done just that in recent years, and Chile can do it too. And we are equally sure that membership of the OECD will be very important in helping us on our way. Chile has gradually completed the different stages of its roadmap, fulfilling each of the requirements. Our Congress is currently debating bills to adjust our legislation on exchange of banking information and the legal liability of companies in cases of bribery, the financing of terrorism and money laundering. Chile is, in other words, approaching the home straight of a long process during which we have been able to improve and modernise our institutions and standards. That is why I wanted to have this opportunity of meeting you personally. To underline my country’s determination to reach the finishing line and - sooner rather than later - to form part of this community of democracies and best practices. Because that is what, in the end, leads to development.